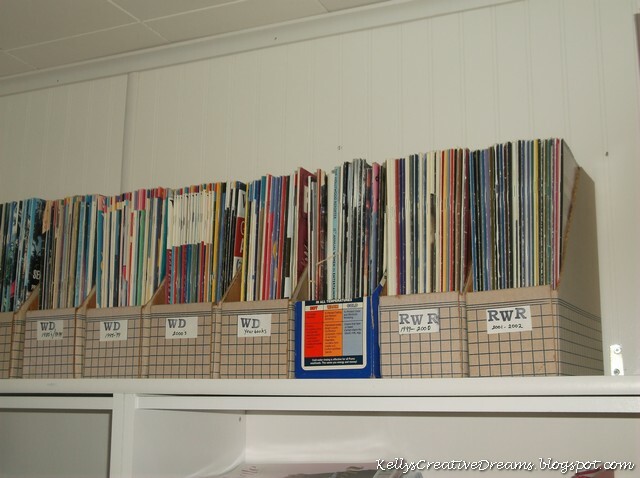 How many of you have a collection of magazines? Why are you hanging on to them? Do they need recycled? I had a light bulb moment the other day. 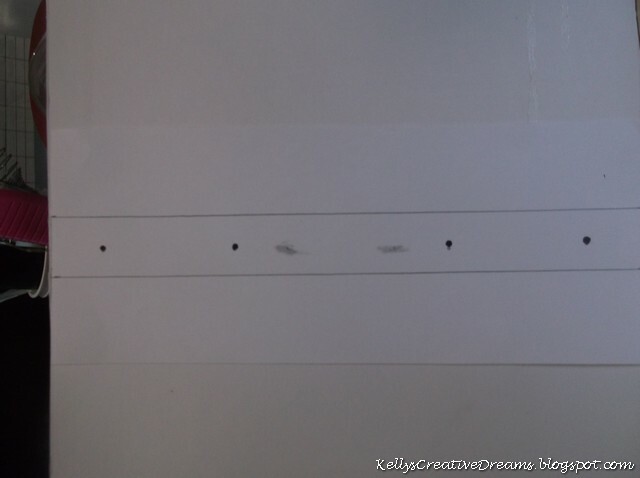 Magazines that are stapled in the center are nothing more than pre-made signatures! Before we get to how I'm using them, a bit of background on the cover..
impressed with a box of food boxes. 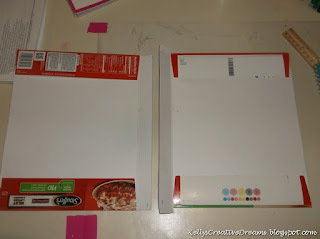 I had him sit and watch a video by Jennibellie on YouTube on making journals from Cereal Boxes. I had been saving boxes for awhile.. but selectively. 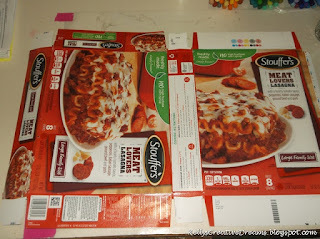 Only boxes that we purchase the same products of... such as this Stouffer's, cake boxes, BelVita bars or FiberOne cookie boxes. 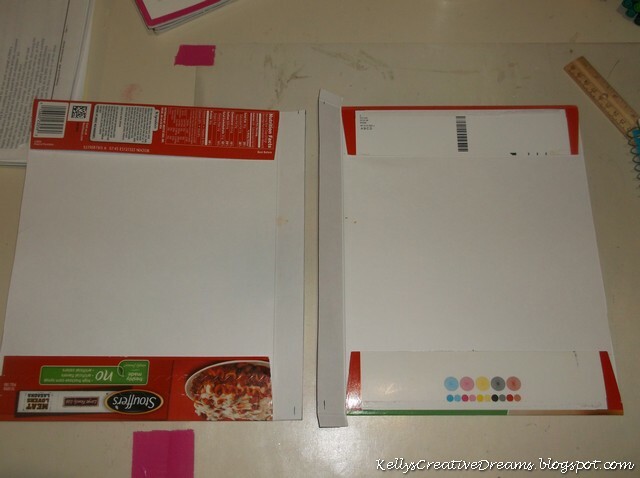 This lets me narrow down what I keep and should I choose to do a journal of just chipboard pages, then I'll have enough that are the exact same size. FYI.. I'm loving the shape of Healthy Choice Steamer packages. 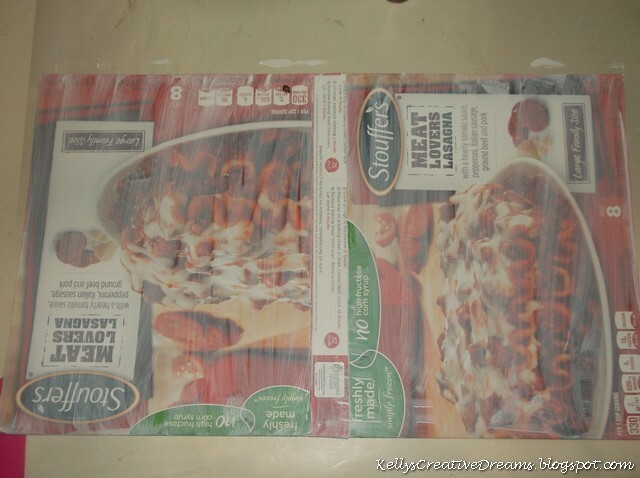 So with this Stouffer's box, I'm diving in! 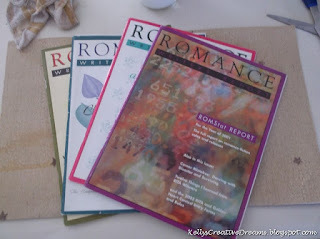 My first big project to launch the 'almost' completion of Creative Dreams Studio is to finally start an art journal. 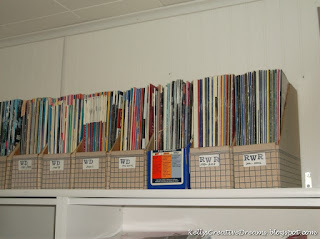 Not just any journal but an En Masse Journal. Rather a let down from what I'd hoped. I guess Shannon's was the 2015. Oh well... 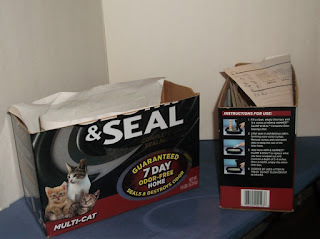 I still liked the concept of the EnMasse Journal so I began with the Stouffer's box.I started by opening the box on the long side seam and trimming off that excess flap. 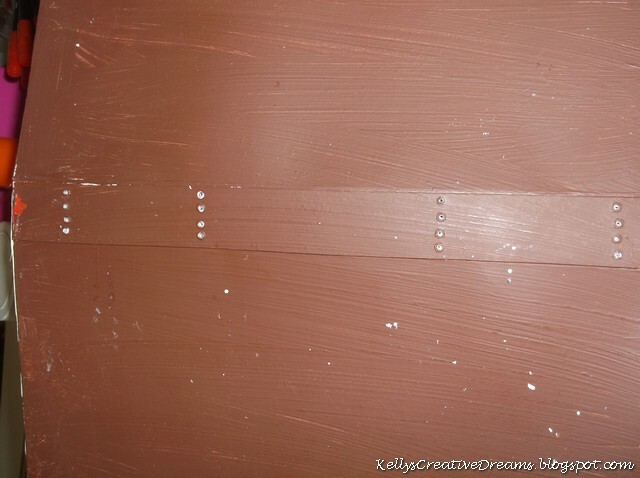 Then I covered the entire outer box with Gesso. Then I found the center of the 'spine' and separated the box into 2 pieces. I did this because the spine was 2" wide... too wide for the number of signatures I plan to include. I also tried what Jennie did by folding in the flaps. The glue was not holding so I wound up pulling them up and cutting them off. With the Spine cut in half, I then layered them over top of one another to form a firm spine. This morning.. and the reason the pictures are late... 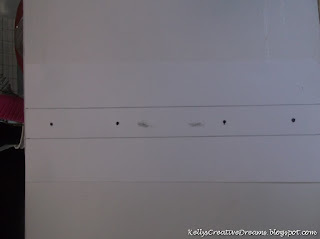 I came back in and marked the holes for my four signatures. 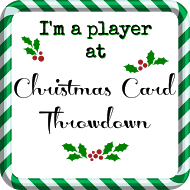 I made a template (shown laying on top of the spine) and found the center. I used Aleene's Tacky Glue and have a few wrinkles but this is a junk journal - a perfect opportunity for me to try and reign in my OCD tendencies and just see where this takes me. Next Monday should be the MARCH Tim Holtz Tag. From here on out, I hope to use the 4th Monday of each month as the En Masse progress post. 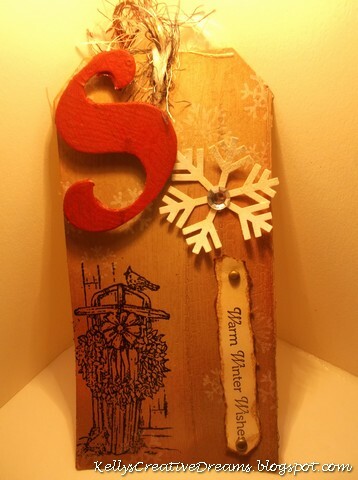 This week I have struggled with my representation of the Tim Holtz 12 Tags of Christmas - 2007. After three attempts, I've finally created a tag I can live with. His Day 2 was much cleaner, due in part I'm sure to using his products. The one thing we do have in common is that both of our snowmen have an 'evil' tint to them. Tim used stamped his snowflakes in white paint. After two tries, I decided I really did not like the look. When I'd heat them, they came out very blurred and more like melted blobs then actual snowflakes. So I switched gears and used VersaMark then embossed with Stampendous White embossing powder. Then I re-heated and added a second layer of a custom mix that included a transparent glitter. I followed his steps for the blue background but I used SU Bashful Blue, Ballet Blue and Pacific Point inks. I needed 2 passes to get the look I was striving for. I stamped the snowman (Plaid foam) in SU Night of Navy then overstamped with the same custom blend to give him a little sparkle. The snowflakes with the brad centers are punched from acetate. The SU Paddle punch was a bear to work with - probably due to the intricacy of the punch. The Martha Stewart punch was much better. I added a purchased SNOW chipboard word and added a snowflake button inked with SU Ballet Blue. For balance, I added 5 sparkly rhinestones in the corner and a variegated blue/ white yarn for softness with a bit of string yarn. Here's hoping the Day 3 tag will be easier. Getting a late start this morning. We had high winds and snow blow through early this morning, taking out my internet. The snow has now stopped and almost all melted away but the wind is still blowing at a pretty good clip. While I waited, I worked on putting more of the Mixed Media side of the office in order in between working on my Tim Holtz revisit tag. This is from Day 2 - 2007. I should have this one ready to post on Friday.I have acetate snowflakes drying and the mottled blue tag base. That large SU paddle punch did not want to turn loose of the acetate snowflake but the Martha Stewart one was a dream. I think partly due to less intricacy in the detail. 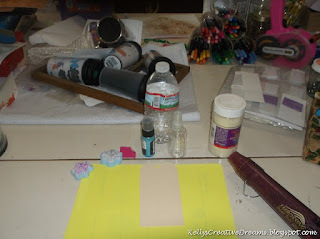 And now that the Mixed Media side is shaping up, I should be able to get back to working with various art journals. Those will make an appearance on the occasional Mixed Media Mondays. Not very pretty, eh? But there is a good use, I promise. For months ahead of putting the studio together, I combed YouTube, Pinterest and Splitcoast Stampers for ideas. I wanted recyclable storage. Items I could use from around the house. I did not want to spend my budget on storage. That money was better spent on new toys for the studio. Right? 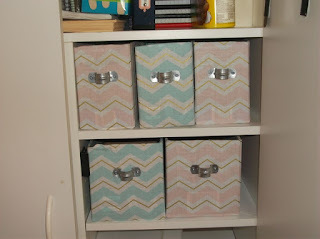 One of the storage solutions that had my attention was this one. While the black with white polka dot looked cool in her room, I wanted color. Though trying to find the right fabric in bulk became a challenge. I had found the perfect fabric prior to getting the budget in place for the build. But when I went back to get the fabric, they did not have any more. So I went to Plan B... A little of this and a little of that. These sit inside of my 2-door mixed media cabinet. I use them to store mostly texturing tools such as large textured sponges, produce netting, and harder tools such as sea shells, threaded pipe, hot rollers, etc. 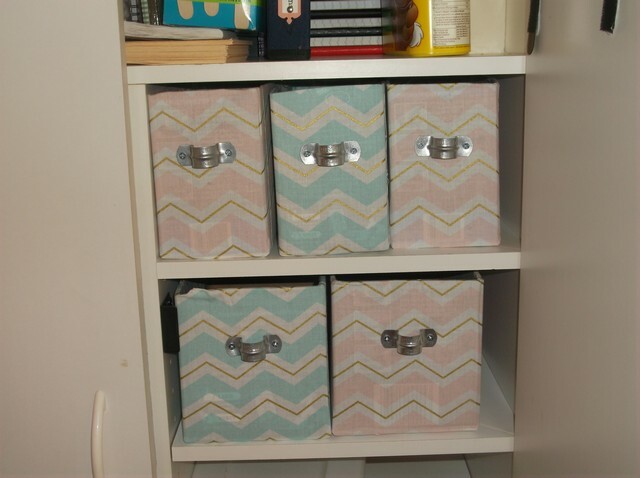 Though I do have a larger box on the very bottom shelf that holds all of my calendars. Not that is finished, I can focus on finishing my ScrapRack. While this might seem a bit staged, it kind of is. I've shoved stuff to the side that I need to put away but can't until Bob gets home tonight, to make room for my next Tim Tag Revisit that will post on Monday morning. 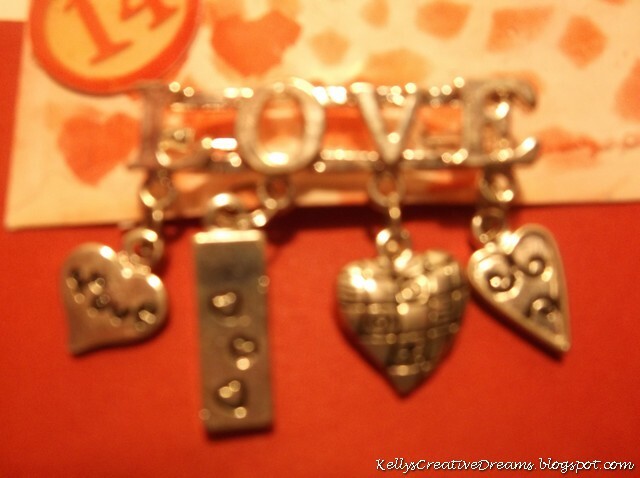 THIS is the tag I'm revisiting. This week, our card is off to Debbie in KS. She is experiencing Liver failure - and has never been a drinker. Really stinks when you think you are doing everything right and something like this comes along. We're hoping our cards can cheer her up. I am trying to use of stash. 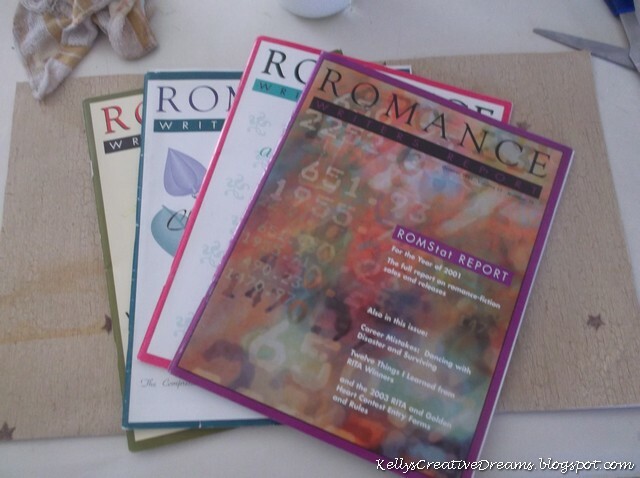 Back in 2011, I was enticed into an Inspiration Kit Swap group by my bestie, Soni from Soni's Front Porch. She wanted to encourage me to play so she sent me a kit like she had sent out to the group that month. I am in belief that not only bad things come in threes, so let's see if we can prove that! I am sending the same images in 3 different colors or way, with directions to do each differently. I hope you have fun. 1 - One card in soft and pretty design and colors. 3 - One card to be as different as you like - BUT please use "3". These can be 3 brads/ 3 different colors, 3 layers, etc. 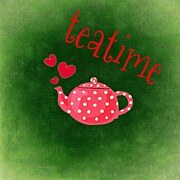 I used the tea pot and cups she had stamped in Memento Black on Very Vanilla. I layered that with the Groovy Guava (retired SU) she included with Pear Pizazz (retired SU). I gave the corners a wrought iron decorative with an EK success corner punch and added metal dots from Colorbok. 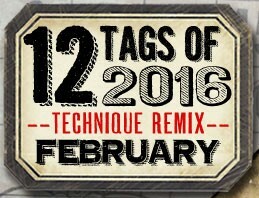 I'm a bit behind getting this tag posted but the February tag became a revelation for me. 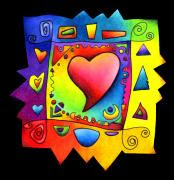 While Tim encourages us to do our own thing with his challenge, I make an attempt to stay within his colors - something that is not the norm for me. However, I just could not get this tag to play nice in that vein. So after the second attempt I decided to use his techniques when possible but to play within my own color pallet. For me, that is a soft, Victorian style most of the time. I used his background technique with a stencil from Fineabair. The hearts were a stencil that I made with my small heart punch and the texture paste/ gold emboss LOVE was done using an ABC stencil from Plaid. 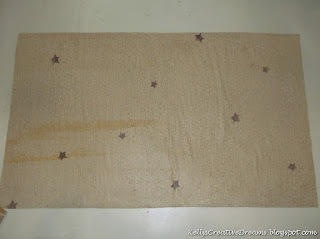 I distressed the tag all over with SU Pink Pirouette then stenciled with SU Real Red. The flowers were punched from book pages and a sheet of floral paper from The Paper Studios (Vintage Amore). First, I distressed the scrip sheet with Pink Pirouette then I punched all the flower layers with the SU Mini Scallop. Then I alternated a book sheet with the Vintage Amore flowers and secured with a jewel brad to create the 3 flowers. The heart was punched from a script sheet out of the Prima 6x6 pad (Printery). I distressed the sheet with Pink Pirouette and edged it with Real Red. Then I heat set the ink before adding Dimensional Glaze and let this dry over night. I also applied the glaze to the '14' paper bingo chip from Tim's Ephemera Thrift Shop pack. The little label tag is from Tim Holtz. I added a rub-on of a Feb. 14 xoxo postage seal from Royal LongNickel rub ons. 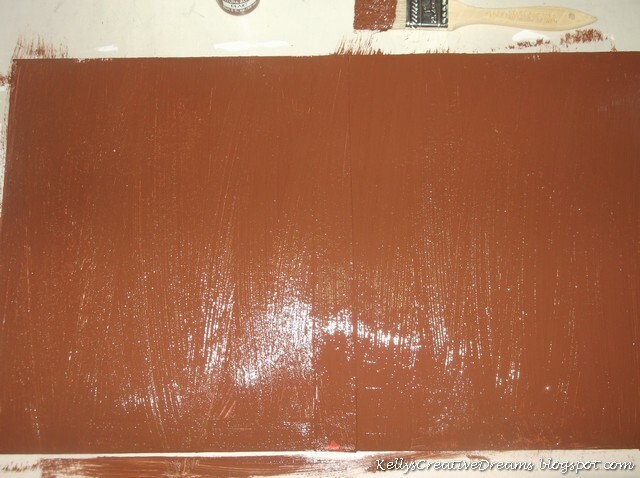 Once I stepped into my favorite color pallet this tag came together pretty fast except for the drying time. 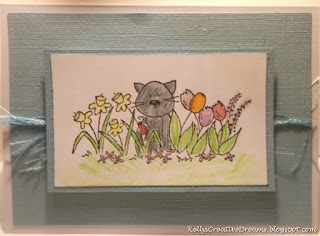 I bet you are wondering why I'm showing a card on Needle & Thread Thursday... a card with not a stitch on it anywhere. A writer friend of mine is not a card maker but she enjoys crocheting and quilting. We've been friends on-line for almost twenty years but never met in person. When her mom passed away in late January, I knew I needed to make her a card (though I've missed several sympathy cards the past few months). 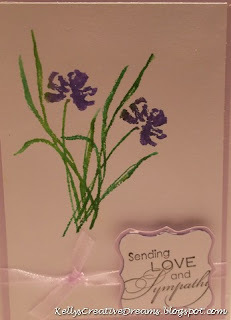 I used the Love & Sympathy set from Stampin' Up. 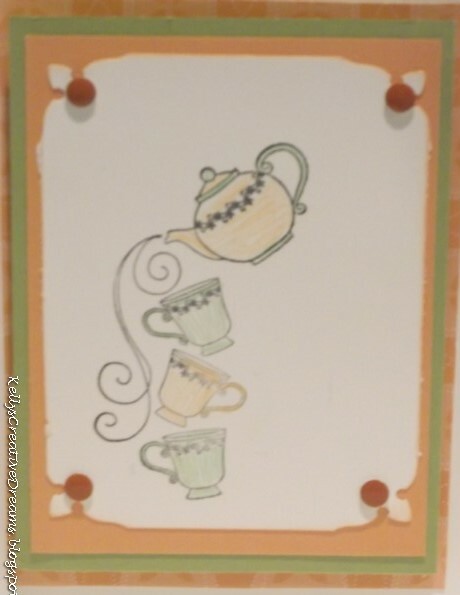 After coloring the image with LePlume markers, I spritzed the stamp with water before stamping onto the cardstock. I used Recollections and GP white cardstock with Pale Plum ink. 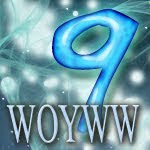 WOYWW #349 - Creative Explosion! For those of you who stopped by last week, this is how the raffle basket for the writer's banquet turned out. My theme was 'Celebrate!' A bottle of Merlot, two wine glasses filled with Hershey kisses, a Dark Chocolate bar and two party horns. 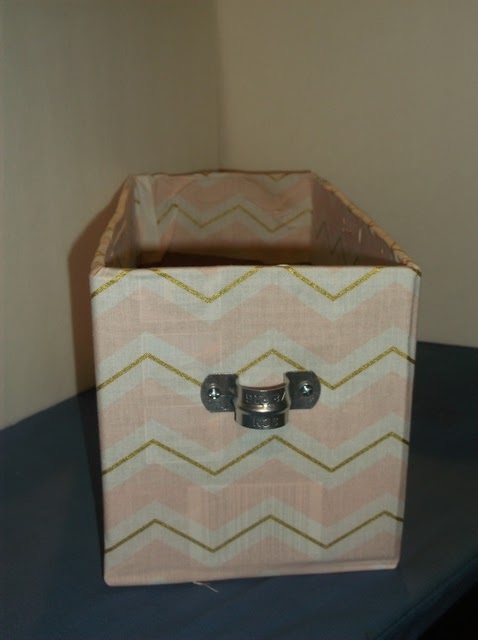 I upcycled a box that 7x9 padded manila envelopes come in by cutting it down at an angle and covering in left-over monochromatic white wrapping paper. 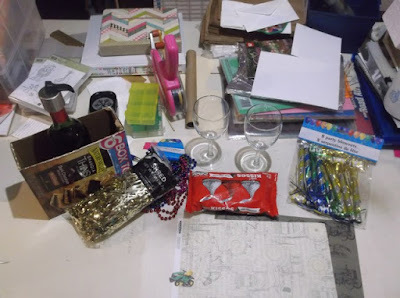 What isn't here is the Merlot colored ribbon around the neck bottle and as a belly band on the front of the box. 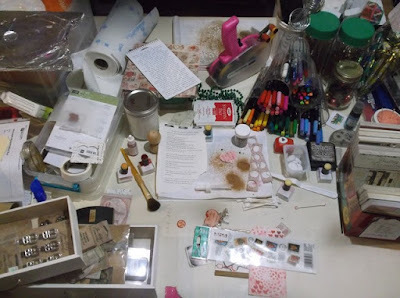 My worktable this week looks as if the high winds we had earlier in the week went through my studio. 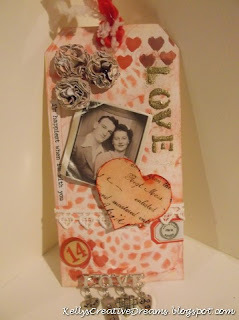 I've been working on my February Tim Holtz tag. After three attempts, I'm finally making progress. I hope to post that tomorrow. 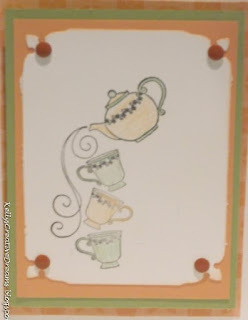 This week's Teapot Tuesday card travels to Kay in Kansas. Kay has been experiencing a lot of health problems and the doctors are not giving her any answers. I know this must be very frustrating for her. She has lost a lot of weight and no longer gets out much. Kay and her husband live in the country. She loves her kitties, her dog, Bear and the color blue... especially the SU - Baja Blue. I had this stamped image in my stash from an old swap and thought it perfect for her. I used the textured Baja Breeze cardstock and added some eyelash fringe yarn. I used my Derwent watercolor pencils. Time to visit creative folks from across the globe. 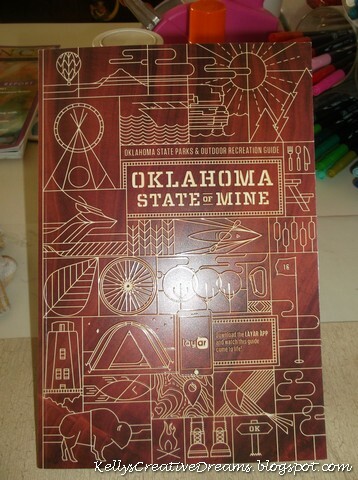 You can pick up your road map at Julia's Stamping Ground and snoop a long. We'd love to see yours! Little bit of change from last week. I have the supplies compiled for a gift basket for a writer's celebration dinner on Friday night. 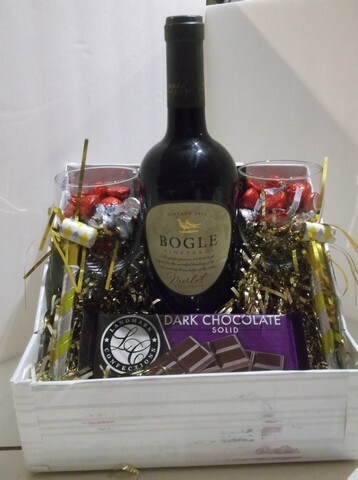 Celebration theme with Wine & Chocolate. 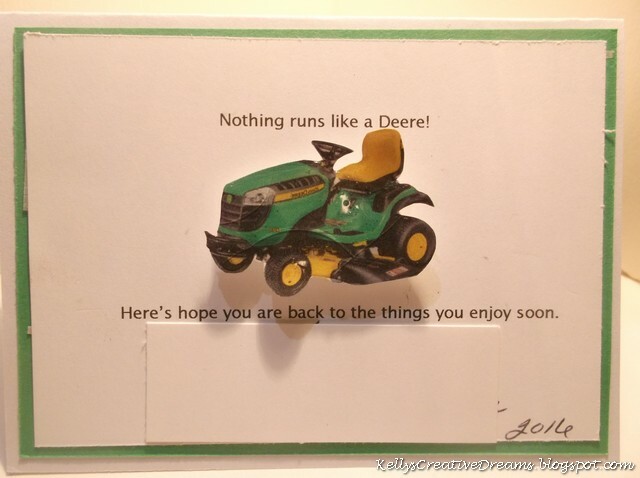 Also some John Deere tractor paper and a cut out of a John Deere tractor for the Tea Pot Tuesday card I did not get made for yesterday. 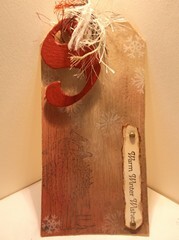 Some of you requested a peek at some of the earlier Tim Holtz tags I am doing. The post is HERE. 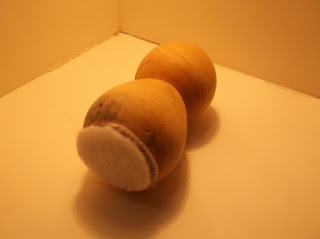 Now... last week a couple of people mentioned the 'egg sponges'. Took me a few minutes to figure out what y'all were seeing. Then it dawned on me. My home made blending tool. The more I looked at Tim's blending tool, the more uncomfortable the item just looked to work with. So I looked for something that might fit the palm better. 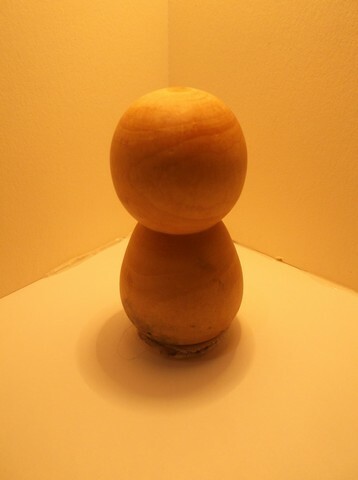 This is a knob of some type that I found at the craft store in the wood section. I attached a circle of Industrial Strength velcro to the bottom. The bottom measures 1"
I cut circles from white felt. These I cut by hand. 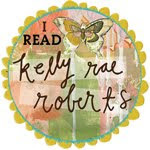 Sometime in the future I am going to order the Originals Sizzix Circles die that has 4 circles - one is the 1"
This is comfortable in the hand, and easy to swirl inks onto my projects. Thank you so much for your patience. For the first time in pretty much 'ever' I could not get this card to come together in a timely fashion. I knew what I wanted and I had all the components but getting the verbiage to line up was fighting me. Finally, after a pain-induced nap Wednesday following a dental appointment, everything fell into place. And as I post this, I see there is a typo. Grrr... Hope I can fix that before I pop it in the mail tomorrow. The tractor is copied from the John Deere website. I cut it out, coated in Papier Glass Finish then popped the image up with pop dots when it had dried. Now.. to turn 'hope' into 'hoping'. Each Monday's post will be dedicated to Mixed Media. 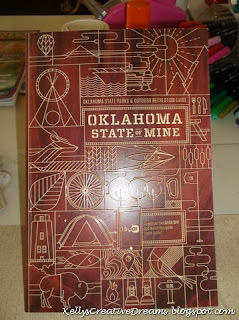 For me that narrows down to three main areas - Art Journals, Tim Holtz, Mini Albums. I've always wanted to do Tim Holtz's tags but just never made the time or space. Last year, while I was between studios, I attempted the tags for the first time and loved the TWO I made. This year, I have the studio and am back at them. If you missed my January 2016 Tag, you can see it HERE. One of the other things I want to do on Mondays is to revisit some of his old tags... tags I wanted to make but never did. This week, I've started with his very first tag... 12 Tags of Christmas 2007 - Day 1. I liked playing with the colors. Tim's version HERE called for using his Crackle Paints. I did not have those so I chose Folk Art colors and a bottle of crackle medium. Here's the thing... Use HIS crackle paints. By using paints and medium separate, you have 3 steps... aka 3 drying times. With Tim's - just ONE step - one drying time. You can bet his crackle paints are on my shopping list now! I also did not have a Santa stamp. (Another item on my 'buy' list). So I chose the vintage sled from SU Winter Memories, as well as the sentiment. The 'S' is from Colorbok Monogram grunge board letters. On the redo I stamped the image in VersaMark then embossed with Midnight Black. I also punched a snowflake using my SU paddle punch. 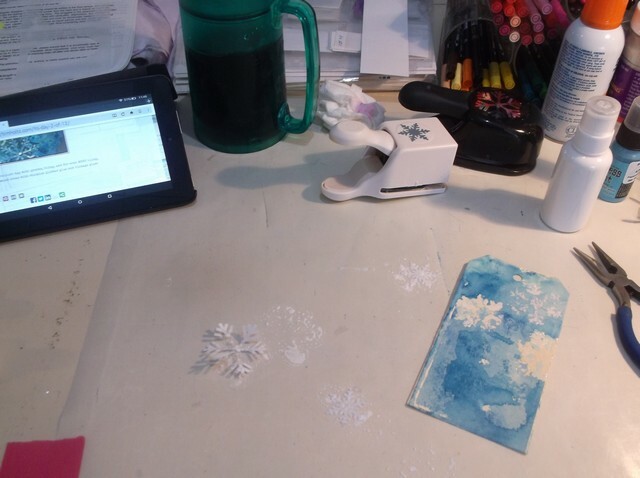 I coated the snowflake in VersaMark then embossed with a custom mix embossing blend. For the background I used Folk Art Linen. 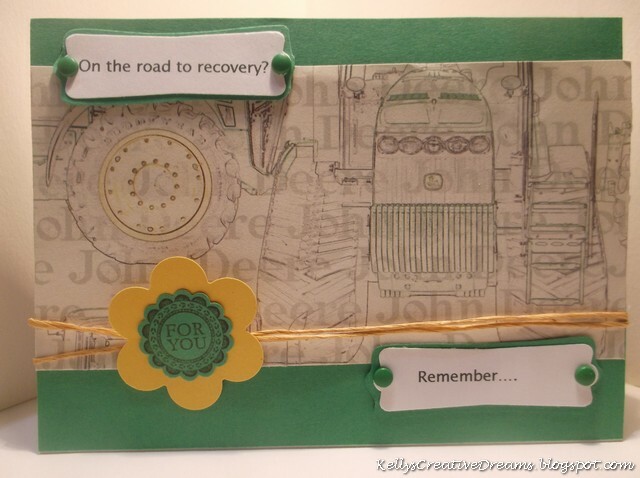 Then I blended SU Cherry Cobbler and Always Artichoke along with TM Distress Ink - Vintage Photo. The sentiment is stamped on SU Very Vanilla then I toned the color down with the Vintage Photo. 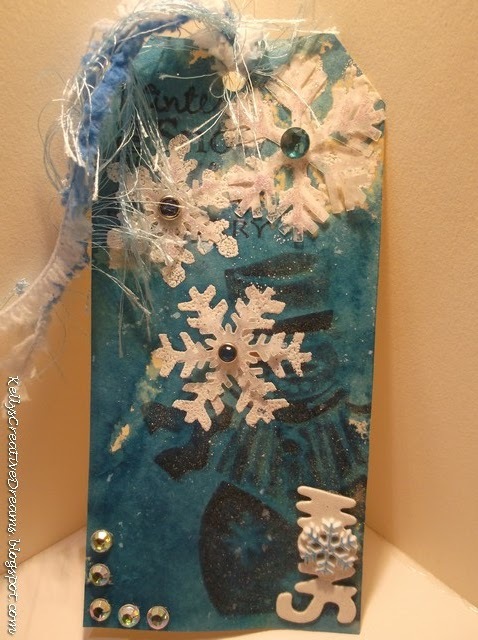 The snowflakes in the background are from a Studio G stamp using Brilliance Moonlight White.